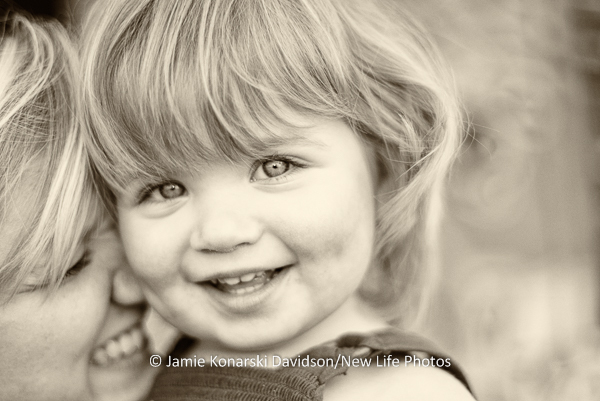 Simple beauty is easily found in the innocence of a child. 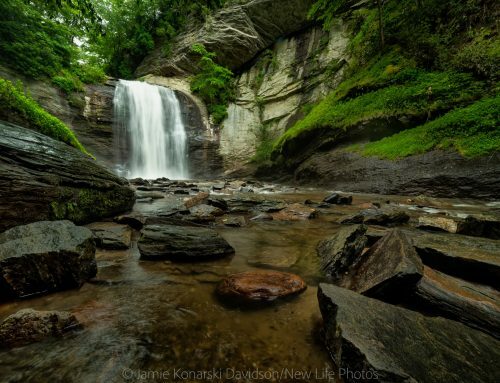 One might think that finding beauty is a simple task. And, it is, when the object of beauty is obvious. 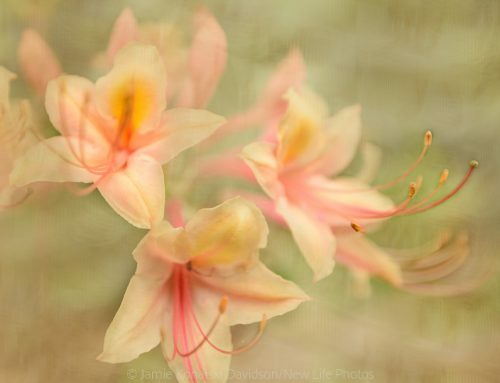 Consider how easy it is to find beauty in a fresh bloom, a young child, an amazing landscape or a simple scene. Finding beauty in the young or new and fresh is no challenge at all. 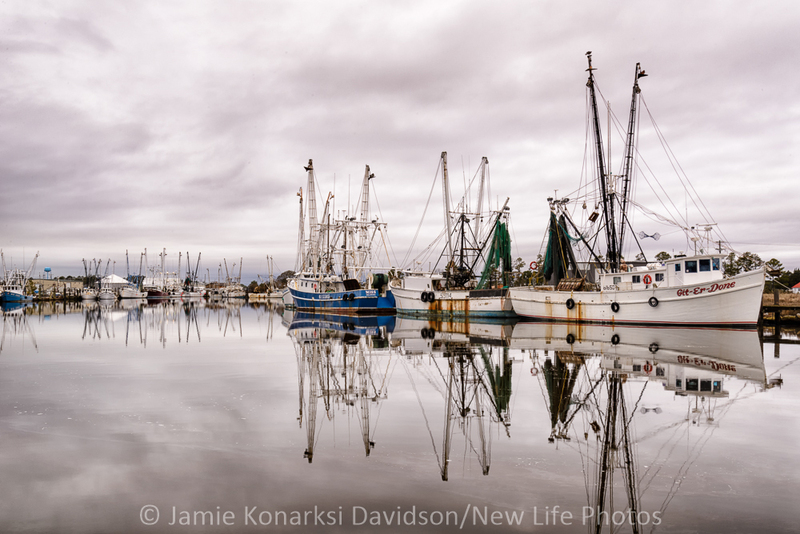 Still waters and reflections in the harbor filled with fishing vessels holds its own level of quiet beauty. Finding beauty in the imperfect, the old and abandoned takes more effort—especially, if you’re not tuned in or open to the idea. 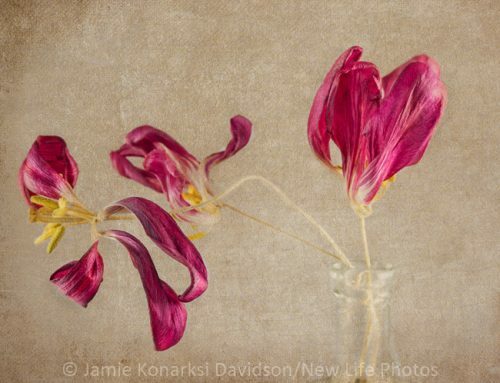 As Minor White observed, “One should not only photograph things for what they are but for what else they are.” Extended metaphors inhabit scars, wrinkles, broken windows and boards, torn fabric, and even, perhaps, dead flowers. 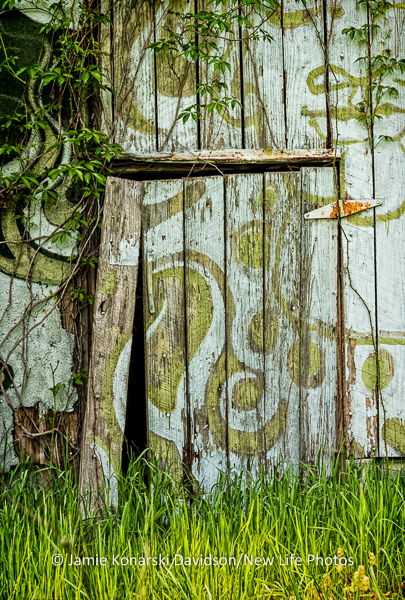 Painted barn door with grass and vines in Cameron, NC. The boards are no longer straight, paint less than fresh and fading. Just about everyone who knows me also knows that I love the old and abandoned. I’m a “collector” of all sorts of things. I have a passion for celebrating unseen beauty. And, I love a challenge. So, in the interest of the challenge to find beauty anywhere, I gave myself one. Much earlier in the year I had picked and photographed some amazing sunflowers (when are they not?). I also let them wither and dry to crispiness in the same vase and kept them around in their decrepit state – that is, until recently. 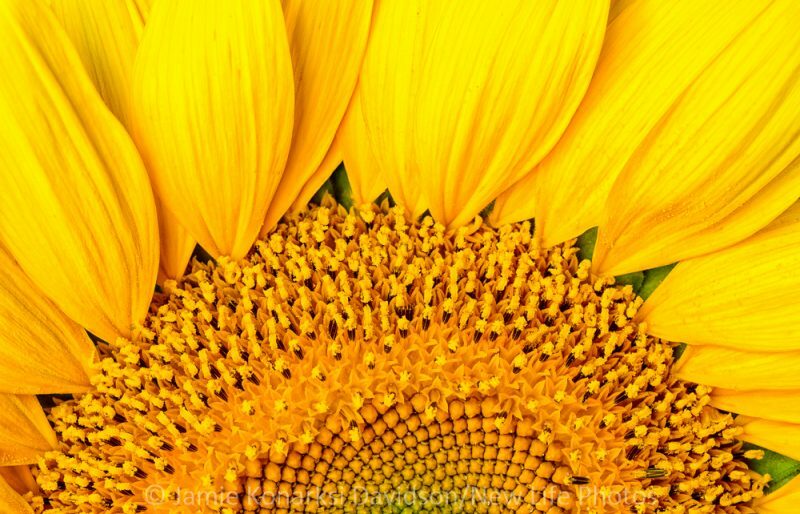 It was time for me to follow through and find what I felt was still a part of those “long past prime” sunflowers – their inner (and older) beauty. Easiest of all efforts to find exquisite beauty in a freshly cut sunflower bloom. Here is where the challenge began. 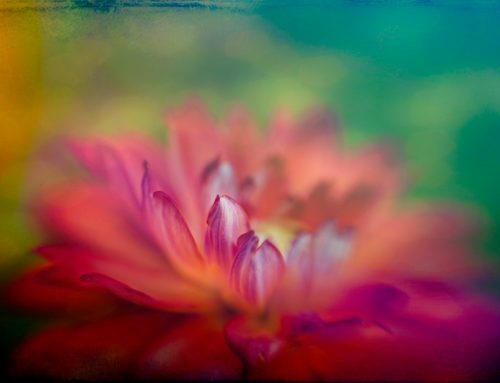 Textured paper background and natural light coming through glass door, using Lensbaby Velvet 56. Working and not working. It was not as easy as I had thought it would be. And, I was most surprised. Remember, I’m the one who loves all things old, falling down, broken and imperfect. I’m also the one who loves, loves, loves flowers. So, I thought, how hard could this be? For the challenge, however, I had to work much harder than I had expected. 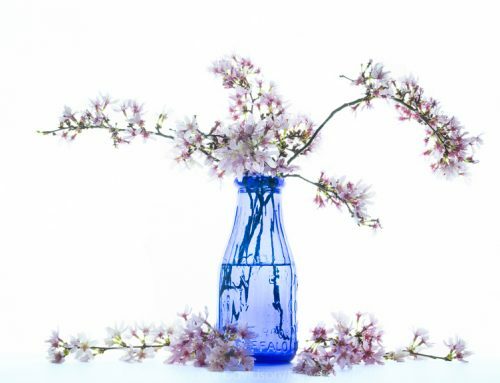 I had to think beyond what I was seeing – the reality of the dried, shriveled, brittle petals, stems and leaves. I had to follow my nostalgia and vision. 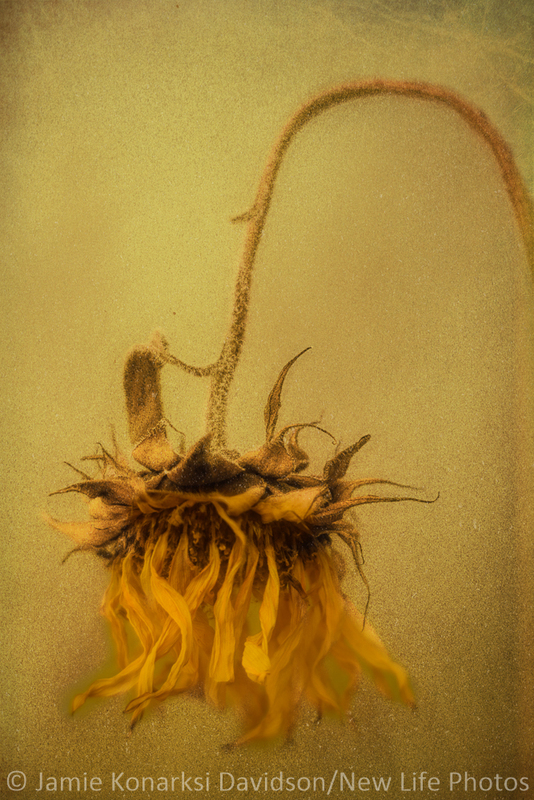 With light background and Lensbaby Composer Pro with soft focus optic, the potential for finding beauty in the dried sunflower came through. This image is minimally edited. I had to find the right tool and best path to share this old bloom’s potential. Experience told me that the beauty was there; I had to bring it out. 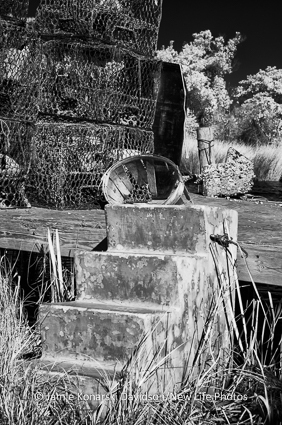 It was far too windy in my usual studio set-up – the back patio. 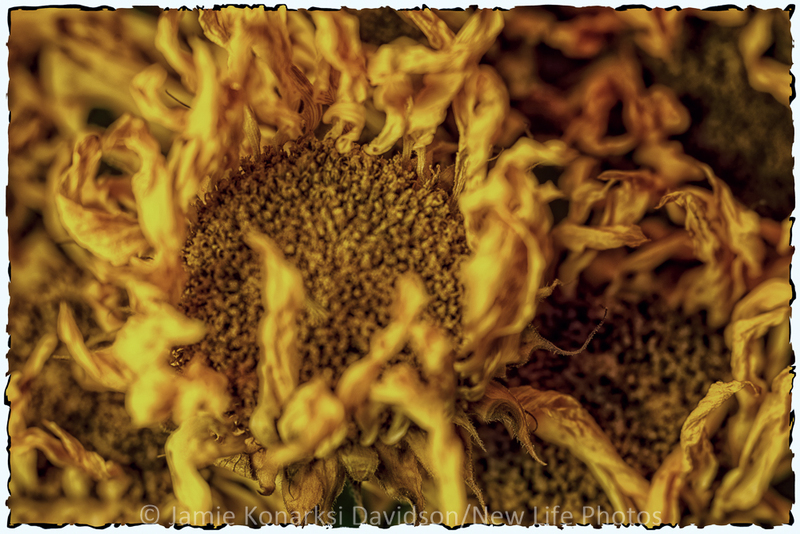 So, I set up inside and began shooting the dried sunflower behind the front glass door, making use of natural and artificial light. This worked and did not work at the same time. The background was less than ideal with the blue door, green canvas print, and even the art paper with green textures. The same image as above with the addition of “Rustic Farm” texture by Topaz Texture Effects, brought out the beauty of the imperfect, old, dried up sunflower for me. This image feels good and right to me to celebrate the decay. 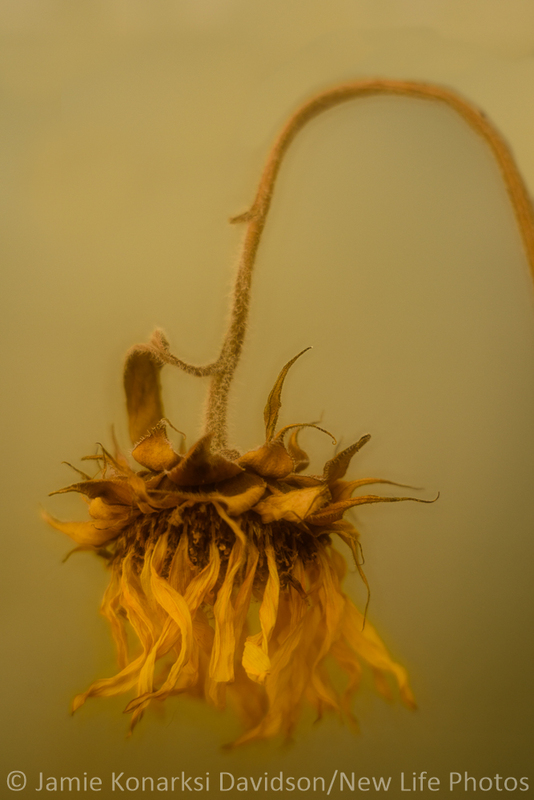 Even before I started this particular challenge, I felt that the dried up sunflower would be a subject that would lend itself to soft focus and later, in post, to some textures. I was right. Reality is not always kind, but vision can be. And this is where I landed. So, you see, this challenge was a mix of several elements: a less than perfectly obvious “beautiful” subject, an open mind, frustration, persistence and vision. If we give up on anything because it’s not easy, we miss out. We miss out on seeing what is, and what could be. We miss out on the “woohoo” of success that sometimes comes slowly and even painfully. Will I try to convince anyone that the results of this challenge are some of my best images? No, absolutely not. They aren’t, but they did satisfy the requirements of the challenge. What I see missing from them is that little bit of heart and soul that accompanies images I love (even if no one else does). What these images are, however, and represent are lessons in stepping up, keeping on and finishing the challenge. As visual artists (and in life), it’s not always obvious or easy to see the good side or the best or the beauty. We have to give ourselves and those things that appear at first glance ugly, old or disposable a chance. We have to open our minds to see the potential we think is not there. We must be willing to make mistakes, and not only “not succeed,” but to fail. 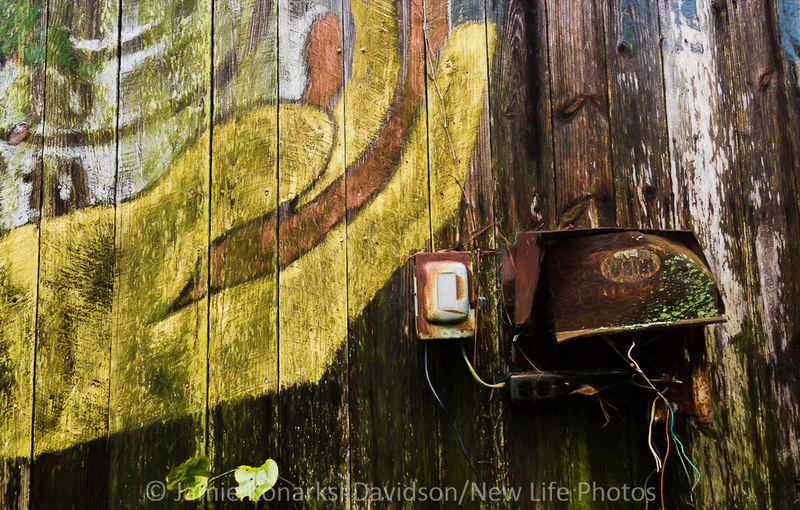 Embracing the imperfections of fading paint and rust in the rural landscape. Embracing imperfection is not easy, but it is possible and valuable, given time and the right set of circumstances. 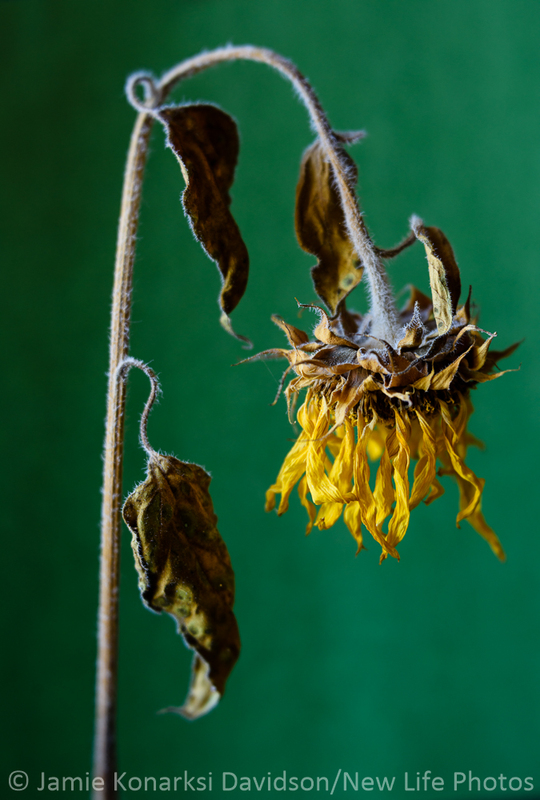 The dead, dried-up sunflowers are disposable. The lessons, for me, are not. Thank you for letting me share.